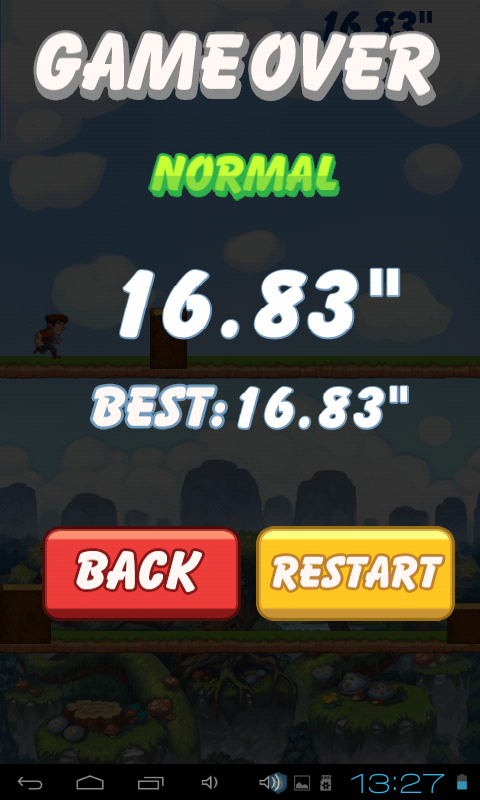 Endless runners are a popular genre – these games are diverse, fun, free and great for time-killing. If you are a lucky person who has time to kill, we suggest you try out this simple and incredibly hard racing platformer – Nobody Dies Alone. At first, I thought there would be some sort of a mission-based running because the title suggested you were to rescue someone. Alas, there is no story to it. In fact, the main game’s perk is its approach to running. You control a bunch of little running people, and each runner has his own track. Your runners dash across a track stuffed with tree stumps of various height, and you have to tap on each runner’s part of the screen to make them jump. The tricky part is to keep them all alive. The controls in this game, pretty much as everything else, are dead simple – you tap on anywhere on the screen part that corresponds to the particular runner. 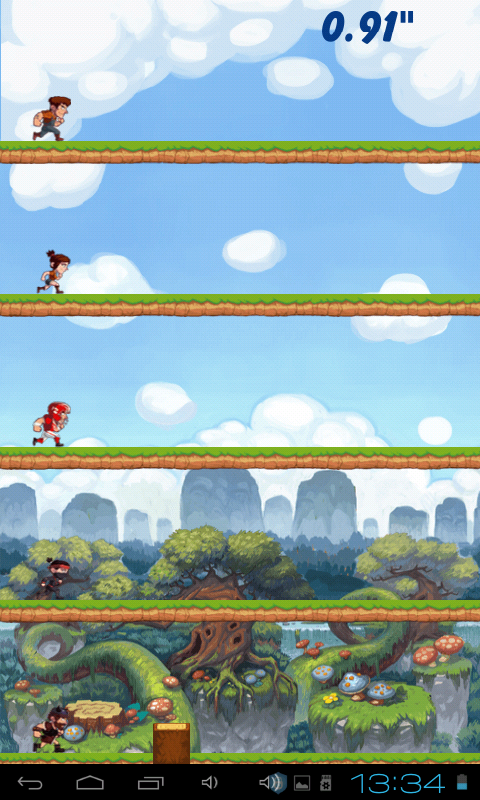 The runner then makes the jump of the same height, which is just enough to overcome the deadly stumps. The game is indecently simple in everything from the premise to the graphic design, but the gameplay is tough, next to impossible. 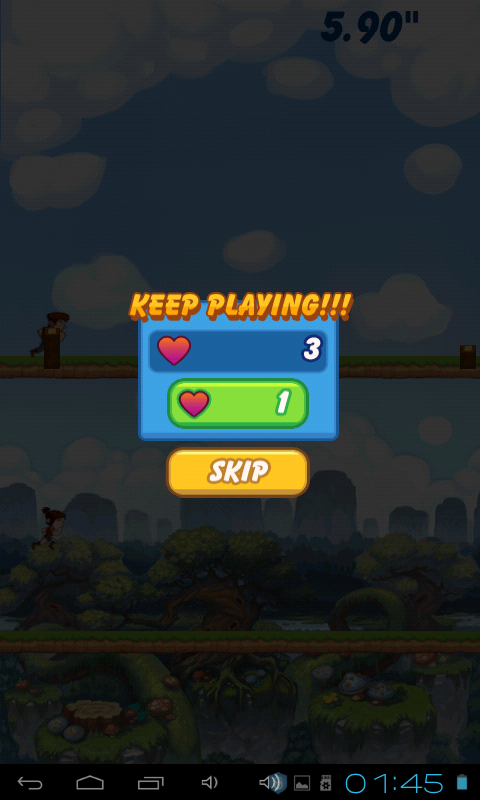 It is somewhat similar to the Flappy Bird kind of games, and unless you are good at multitasking, I mean really quick multitasking, you will get bored in no time. Nevertheless, I suggest you give it a several more tries, and maybe have a friend play with you. There is no multiplayer, but you can play with one more person sharing the same screen. It does not get easier to advance, though. The game is unapologetic, and should you longer for a split second – game over. 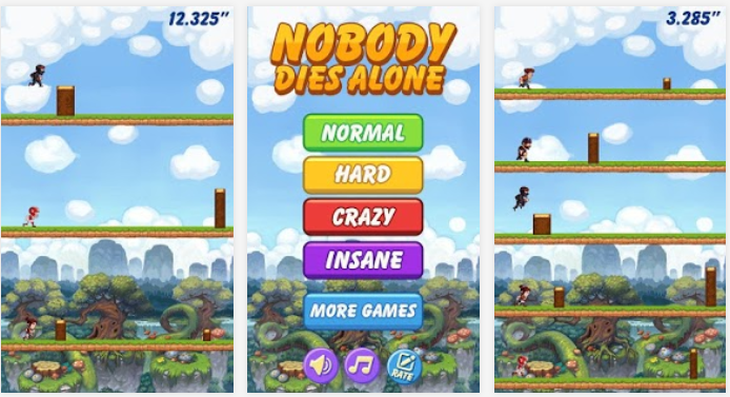 The levels correspond to the number of runners – Normal with two runners, Hard with three runners, Crazy with four and Insane with as much as five runners dashing along their tracks simultaneously. I cannot, for the love of God,image anyone beating the game when playing alone, although the Normal and maybe Hard levels are possible to master when playing in duet. The visuals are colorful, but uninspiring – the game looks somewhat monotonous in visuals, which does not flatter the gameplay. The sound score is quite simplistic, and a couple of more energetic tracks would have complemented the gameplay a lot more than the dull cartoonish background chirping. If you have been hooked on Flappy Bird, and if you appreciate tough challenges in reflex-testing games, Nobody Dies Alone is a perfect time killer. It is free, and a lightweight download with no particular permissions. There is a magic revival crystal, but considering the frequency with which your runners crash and die, it is pretty useless. Overall, the game is fairly addictive and can serve for a few commuting sessions when you need some entertainment on the go, which does not require too much thinking. 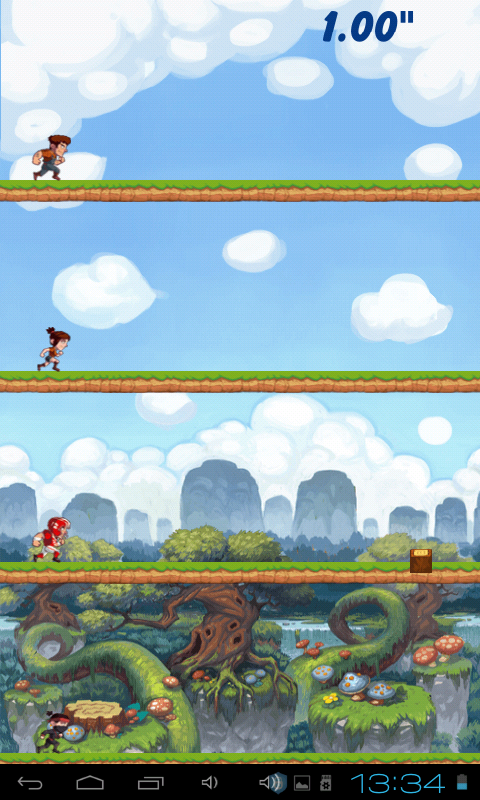 The game is a pure reflex testing machine, and the unusual approach to endless runner genre makes it worth checking out. 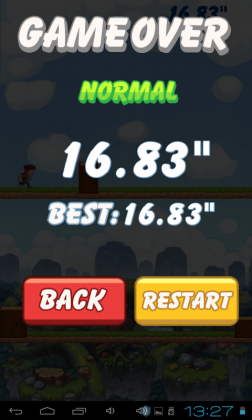 The game is a pure reflex testing machine, and the unusual approach to endless runner genre makes it worth checking out.